An entry level kit for your very own stove top brewery, all you'll need is a large stock pot, kitchen thermometer and material to insulate your pot and you will be brewing in no time. 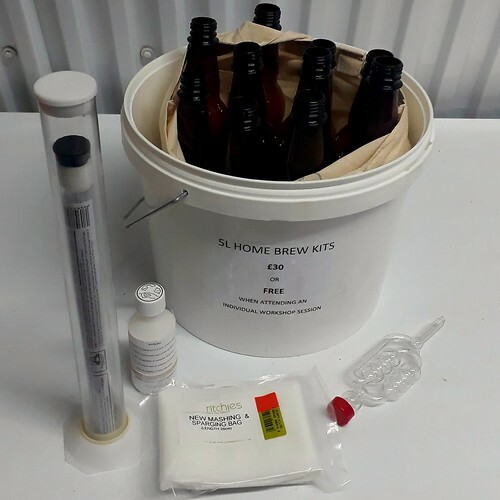 Kit includes 10 litre fermenter with lid and grommet, airlock, sanitizer, hydrometer, trial jar, mash bag, 10 x 500 ml amber PET bottles, meter of syphon tube plus instructions on how to use it all. We'll be introducing some 5 litre all grain ingredients kits shortly and in the meantime if you fancy some recipes, just get in touch.